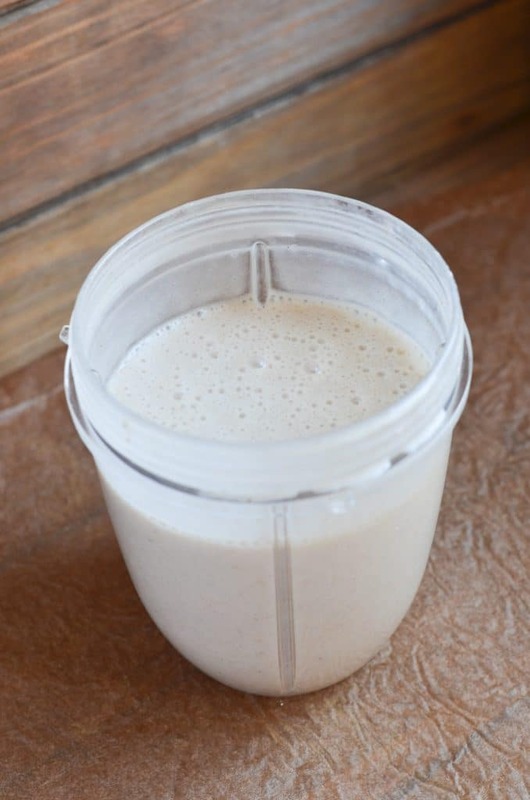 Home » Seasonal and Holidays » Easy Blender Dairy Free Eggnog! 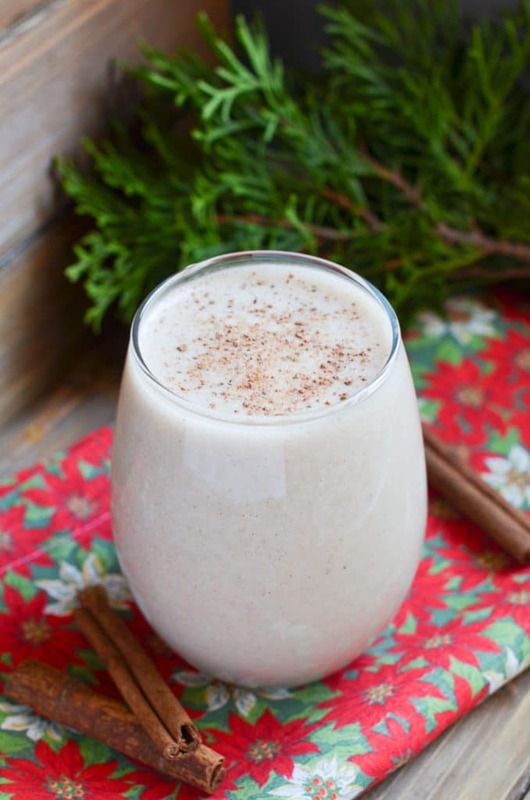 Creamy, dairy-free eggnog that is vegan and Paleo! 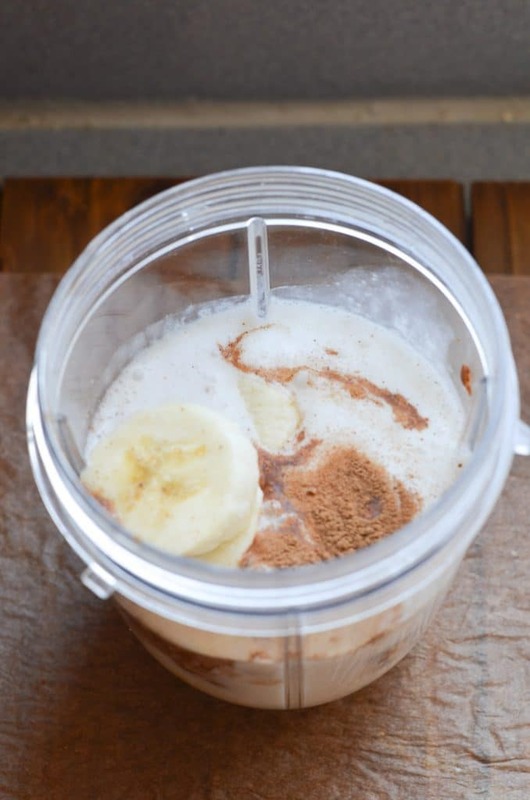 It’s so easy – all the ingredients get whipped up in a blender! One sip and you’ll be in the holiday spirit! Add a splash of rum and turn on the holiday music! I have tried several grocery store dairy-free eggnog drinks, but there were issues, so I stopped buying them. Either the taste was off or I did not want to consume the particular ingredients that were necessary as preservatives. This is a fresh, preservative-free and easy dairy-free eggnog recipe with no gut irritating additives that tastes really good. Try it with a splash of rum for some fun! Add a fun garnish of pomegranate seeds for holiday color. I have also added a sprinkle of ground nutmeg, but ground cinnamon would work as well. Be sure to read the helpful tips further down the post. Step 2 – Place all the ingredients in a blender. Step 3 – Blend for several minutes until the ingredients are combined. As you can see, I love to blend until the eggnog is nice and foamy! Step 4 – Pour in a glass and garnish with a sprinkling of freshly grated ground nutmeg, or ground cinnamon. Add pomegranate seeds for festive holiday color, or a cinnamon stick or two. 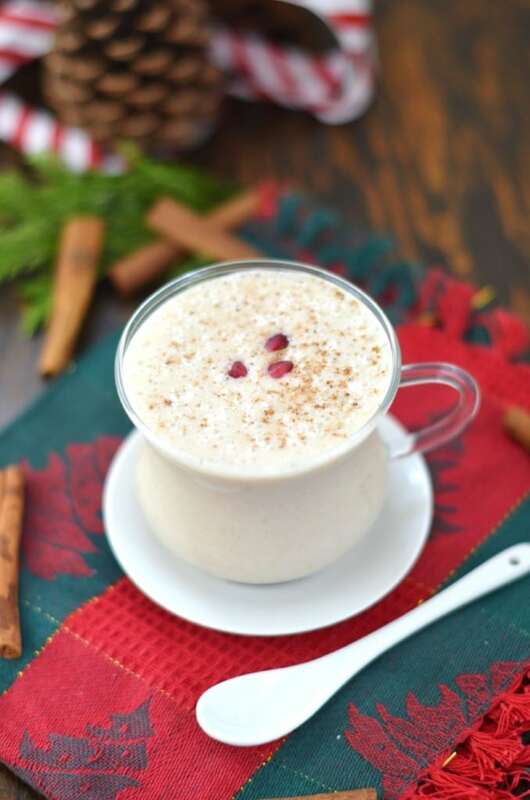 This dairy-free eggnog is also delicious with a splash (or two) of rum! If you do not have frozen bananas (because of time, etc…), you can use a room temperature banana and just add about 4 ice cubes. This eggnog is best made and served right away, but can be made an hour ahead and stored in the refrigerator until ready to serve. You may want to re-blend again for texture. Another non-dairy milk may be substituted for unsweetened almond milk to make this beverage nut-free. 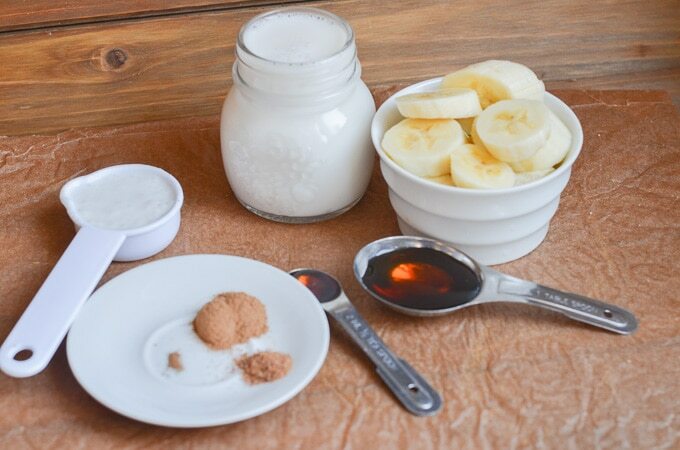 Try blending all the ingredients except the maple syrup, and add at the end if you desire more sweetness. 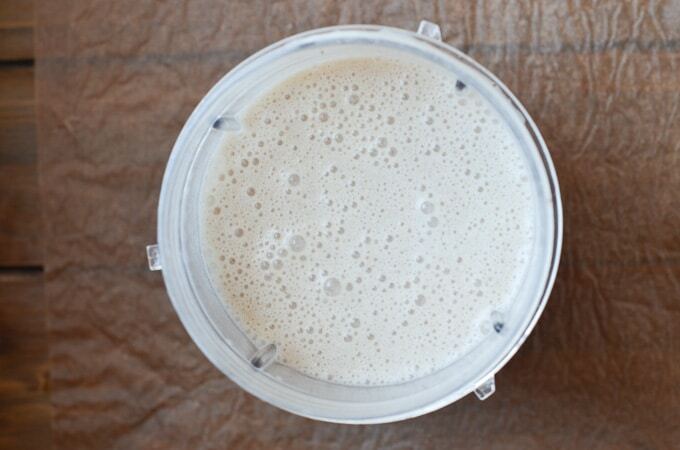 Creamy, delicious dairy-free eggnog that is also vegan and Paleo! One sip and you'll be in the holiday spirit! Turn on holiday music and add a splash of rum to this beverage for a festive time! Soon to become your favorite super-easy holiday drink! Place all ingredients in a blender and blend for a few minutes until completely combined and a little foamy and frothy. Garnish with sprinkled cinnamon or nutmeg. I have garnished with a few pomegranates for holiday color. Optional: add a splash of rum. If you do not have frozen bananas (because of time, etc...), you can use a room temperature banana and just add about 4 ice cubes. Update Notes: This post was originally published on December 21, 2015, but was republished with an updated recipe, new photos, step by step instructions and photos, recipe tips and a video in November 2018. Hi Stephanie – Sorry, I have not tried a substitute for the banana. A little chia seed might work to help thicken, and you’d probably want to add a little extra maple syrup for sweetness. I love egg nog, but it is so rich and fattening that I tend to avoid it. This is a delicious alternative. Can I make this a day ahead and store it in the fridge or is it best to drink immediately? Sorry for the delay Candice. This drink is best made and consumed immediately.